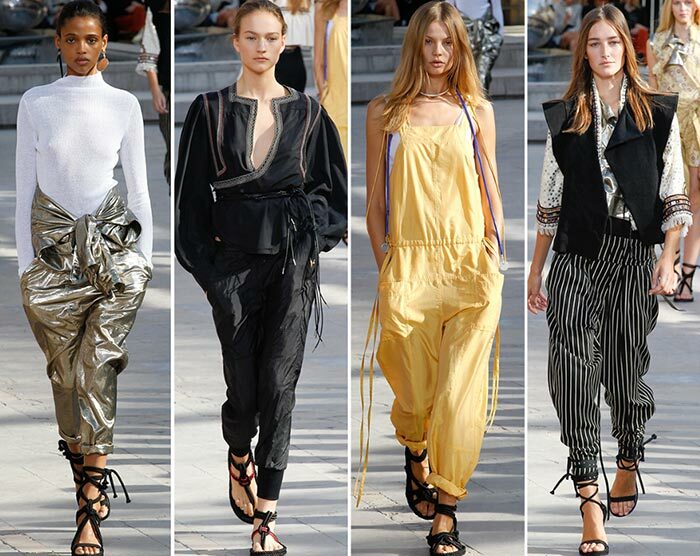 The rebellious Isabel Marant girl infected a huge band of ladies with her turbulent and revolutionary essence once she allowed them to pamper themselves with her comfy and relaxing pieces afterwards tactfully imprisoning them in her world with those ultra-practical and functioning-everywhere sneakers. 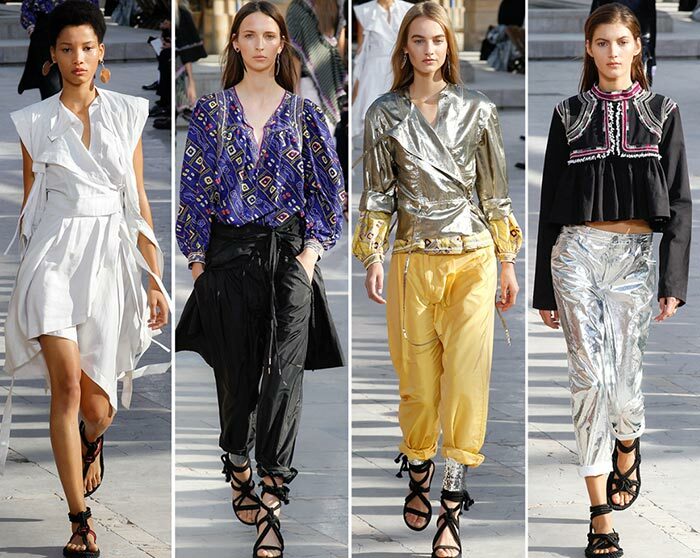 The Isabel Marant spring/summer 2016 collection is sneaking to us again threatening to nestle on our bodies in the spring to come and, frankly speaking, the attack is more than pleasing for us. 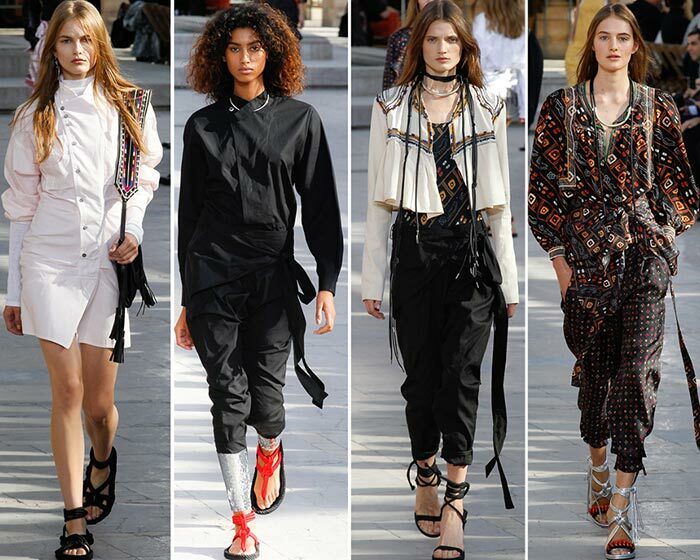 The functional spring 2016 lineup just unveiled could absolutely reveal its rolling stone appeal only in the open air and the perfect venue for the show served Jardin du Palais-Royal, where the collection was launched yesterday when the weather was just perfect to treat the attendees with a spring line-up that was totally drenched in sunrays and a typical ’80s feel. “It’s a new contrast of minimalism and something more decorative mixed together with a very sporty and easy attitude,’ explained Marant the collection’s quintessence backstage. 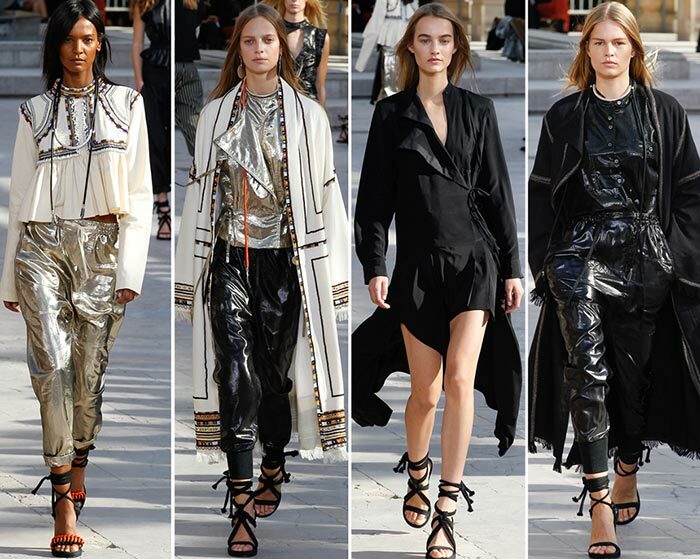 Actually, Marant didn’t go so far from her aesthetics. We see the same typical-of-her free motions, bohemian spirit and ensuing strong orientation where to move further. Only this time around she had attached some ethnic elements and sporty chic to the whole Marant-style we have been familiar with ever since. What she presented to us is destined to hypnotize and enslave those active girls who are living and working between different continents and who need to wear something ultra-comfy and ultra-stylish at the same time. 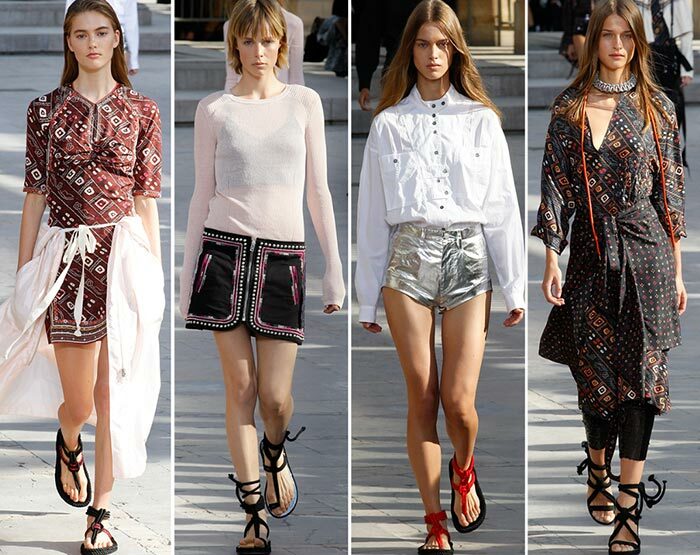 That is why the Isabel Marant spring 2016 collection appeared to be so laid-back, peeling away of the body and with a twist to wrap and envelope the feminine body with its multiple layers and asymmetrical hems. The low-slung harem pants and baja-style trousers that were nonchalantly flaunting in case of even the slightest motion letting the breeze pass through them took us somewhere near a sultan’s wardrobe. Tribal motifs in forms of thin stripes were peacefully playing on rims of an elongated bathrobe-style coat, on a fringed cape thrown on the models’ shoulders in one look and cinched at the waist over the harem pants in another one. Afterwards we see a white parachute anorak fastened around the model’s waist over a mini dress decorated with ethnic patterns or a sun skirt worn over pants thus enhancing the lineup’s easy attitude. There were plenty of mirrored silver pieces and polyethylene-texture-imitating dresses and pantsuits that seemed to crazily rustle while walking. At times we were witnessing multiple folds, tassels and straps intersecting on a single look in that way creating a real earthquake on the models. Maize yellow had painted a pair of tucked-up loose-fitting pants, a pantsuit with long straps hanging from both sides and a wrap mini dress, which was lost in multiple cutouts. The models’ necks were also in the world of straps embellished with necklaces stretching straps at two sides. We do not see Isabel Marant signature sneakers this season but don’t panic; instead your feet will feel comfy in those soft leather lace-up sandals and flip-flops in the spring to come.